As a volunteer staff member I spent most of my time at the reception desk, though I did get to listen to most of the presentations via the speaker system and was given some free time to check out the games being presented during the demonstration period. I didn’t get to see all the games — no one did, I think — but I saw some great stuff on the floor. One man just walked around carrying an iPad with a playable demo of an artistic, relaxing game in which the player moves through a pop-up book whose aesthetics are based on traditional Japanese paintings. Another game was a 2D platformer with unremarkable graphics, but whose gameplay was extremely fun because the developer had completely rethought movement. Then there was the first person shooter game in which you played a fish, spitting water at other sea creatures and able to move in any direction through a 3D environment. There was a lot of variety on display. There was one game I saw, however, which stood out to me as epitomizing Mielke’s point about Japanese developers taking inspiration for their games from a cultural pool in which western developers don’t swim. The game is Monken, from Team Grand Slam, and it’s a game in which the player manipulates a crane with a wrecking ball to destroy buildings. Yes, the wrecking ball has a face. It’s hanging on to the string by its hands, and when it gets too tired to hold on any longer, it’s game over. I had seen a trailer for this game the night before, at a meeting to bring volunteers like myself up to speed and finish some last minute preparations for the day. It looked like a lot of fun and it was one of the games I looked for when I was checking out demos. When I found it, I asked the developer if the goal was to destroy as many buildings as possible. Each building has a terrorist in it, a man with a blue hat. The terrorist looks out a window every now and then, showing you where he currently is in the building. You control the crane to swing the wrecking ball, destroying the building until you get the terrorist, after which hostages run out, the building catches fire, and you can move on to the next building. Okay, I thought, that’s one way to make a game about fighting terrorism without using guns. After all, Japan is a country with extremely strict gun laws and a certain amount of pacifism written into their constitution. Destroying buildings to take out terrorists with hostages certainly isn’t something I would have come up with if I wanted to make a gunless anti-terrorism game. I was ready to write it off as just an unorthodox design choice until the developer told me that it was based on something the Japanese police actually did in 1972. Five terrorists from a group called the United Red Army holed up in a defensible vacation lodge, taking the owner’s wife hostage. When the terrorists refused to surrender the police took a number of actions to try to force them out, including taking a wrecking ball to the building. It was the first event to have live streaming news coverage for hours on end in Japanese TV history, and the incident sparked a change in the political leanings of the general populace. The developer had an iPad loaded with old newspaper pictures of the event. This is the sort of event that a people does not quickly forget. The knowledge of it floats through a shared cultural consciousness, waiting to be remembered even by people who didn’t witness it firsthand. Don’t understand what I mean? Consider this: as a United States citizen, I know a lot about U.S. news coverage of the first men walking on the moon even though my parents were just kids when it happened. I’ve heard about it from people who saw it; I’ve seen recorded clips; I’ve read about it in school. I know that practically the whole country was watching when that first boot touched the surface of the moon. When such big events happen, a nation stops functioning as normal for a bit. Everyone is affected and the memories linger to be passed down to the next generation. Maybe that’s not the best example, since the first man on the moon was pretty big for the whole human race. However, I have no clue how the Russians, who had tried so hard to beat us there, reacted to the U.S. getting there first. What about other countries? In some places, where people were busy just trying to get enough food to feed their families, did they hear about it in a timely fashion? Would the people in those places even have cared much? I don’t know, because I’m from the U.S. and learned about it through the lens of my home country’s cultural consciousness. Cultural influences like these are the sort of thing that can’t be faked. You either have it or you don’t. No matter how much you learn about another culture, you can only learn so much. Not only will there still be things you’re unaware of, you may not see all the connections between the things you do know about. People from different cultures learn different manners, different morals, different reasons for everything. And when a person creates something, all that cultural knowledge affects what they come up with, consciously or subconsciously — or both. Those of us from western English-speaking countries have a lot more culture in common between us than we as a group do with the Japanese. That puts the Japanese developers in a position where they can create games that western developers are far less likely to come up with, indie or otherwise. When combined with the innovation that crops up in indie game development as a matter of course, these guys have the potential to help push the boundaries of available gaming experiences really far. There are some very cool things going on in the Japanese independent development space and more still that can happen. And that, I think, is the point of BitSummit — helping make more new gaming experiences available to everyone. 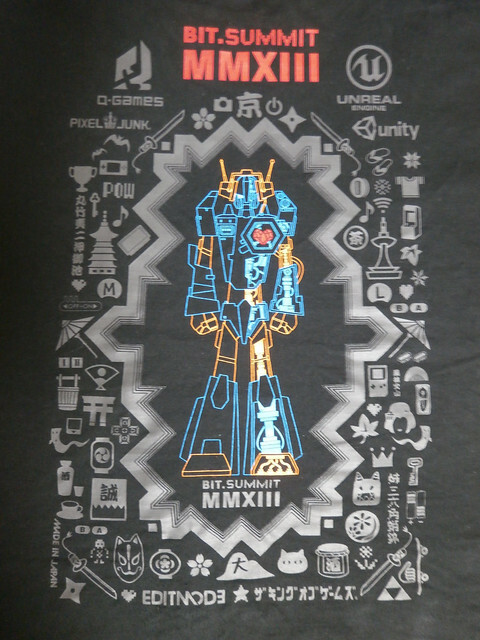 This entry was posted in Games, Japan and tagged BitSummit, Monken, Video Games. Bookmark the permalink.